Eligible for DEWALT's Holiday Promotion. This item is eligible for our DEWALT holiday promotion of $25 off a $100 purchase when shipped and sold by Amazon.com. HEPA Replacement Filter for DC515 Dewalt replacement parts are built with quality and are very durable. Replace a worn out part or have extra parts on site for a quick fix. These are a must have for any one working with DeWalt tools. Features: Fits DC515 HEPA Filter Traps 99.97% of Dust as Small as 0.3 Microns Wet/Dry Filter Eliminates Change Overs Washable filter; Tap or water rinse to clean DEWALT is firmly committed to being the best in the business, and this commitment to being number one extends to everything they do, from product design and engineering to manufacturing and service. 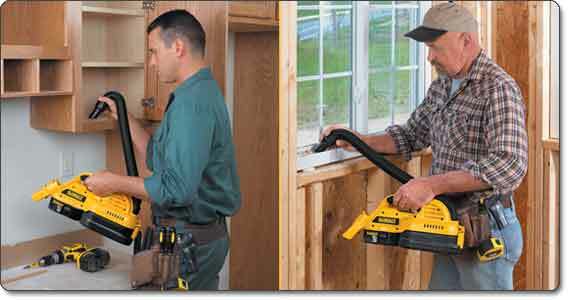 The DEWALT DC515K 18-Volt Cordless 1/2-Gallon Wet/Dry Portable Vac makes your shop or jobsite cleanups quick and easy. Powered by DEWALT exclusive extended run time batteries, this wet/dry vac features a durable tank that's suitable for both wet and dry messes. For added convenience the wet/dry vac features a flexible hose, a front utility nozzle, and a washable GORE filter. 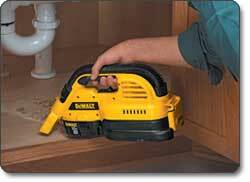 Use the wet/dry vac for quick and easy jobsite clean up. View larger. 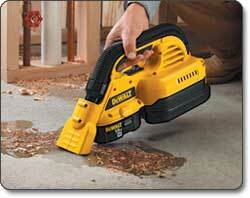 This cordless 18-volt wet/dry vac features a 1/2-gallon tank. View larger. Built to make clean up quick and easy, the DEWALT 18-Volt Wet/Dry Vac goes wherever your work takes you with its cordless design and 1/2-gallon tank. Contributing to its portability, the entire wet/dry vacuum weighs just 6 pounds. A heavy-duty latch secures the tank when the vacuum is in use, and is easy to release when it's time to empty and clean out the tank. The DC515K also features a large on/off switch that is easy to access with one hand, and dual clean-up modes that allow you to choose between removing debris with the vacuum's front utility nozzle or an extendable rubber hose. The hose option utilizes a heavy-duty rubber hose that is both durable and flexible. And at 2-1/2 feet long and 1-1/4 inches in diameter, it provides the size and reach you need to get under work tables or in other tight spaces. At the heart of the DC515K's performance is a GORE HEPA wet/dry filter that's rated at 0.3 microns and traps 99.97 percent of dust particles. This capture rate helps to keep work sites looking their best and helps to keep the air you breathe cleaner and safer. This washable filter is incredibly easy to clean. You can either tap the filter clean or rinse it clean with water--no big mess or complicated cleanup. A tool's only useful if it runs long enough to get the job done and the DEWALT XRP extended run time batteries keep the DC515K running at full tilt. They provide up to 40 percent more run time than standard Ni-Cad batteries, and any XRP battery can be used with any 18-volt DEWALT tool, which allows you to expand your system by adding other DEWALT cordless tools (sold separately) as the demands of your job grow. The DC515K 18-Volt Cordless 1/2-Gallon Wet/Dry Portable Vac comes with a DEWALT warranty package that includes a three-year limited warranty and a 90-day money-back guarantee. DC515K 18-Volt Cordless 1/2-Gallon Wet/Dry Vac, one-hour Ni-Cad charger, and 18-volt XRP Ni-Cad battery. Use the heavy-duty rubber extension hose to access hard-to-reach areas.